The hundreds of thousands who have swum, run, skipped, knitted or jumped up and down on a pogo stick to raise funds for AMF have inspired Rob, CEO and Founder of AMF, to attempt his first marathon. "This will be my first marathon - and at my advanced age probably my last! 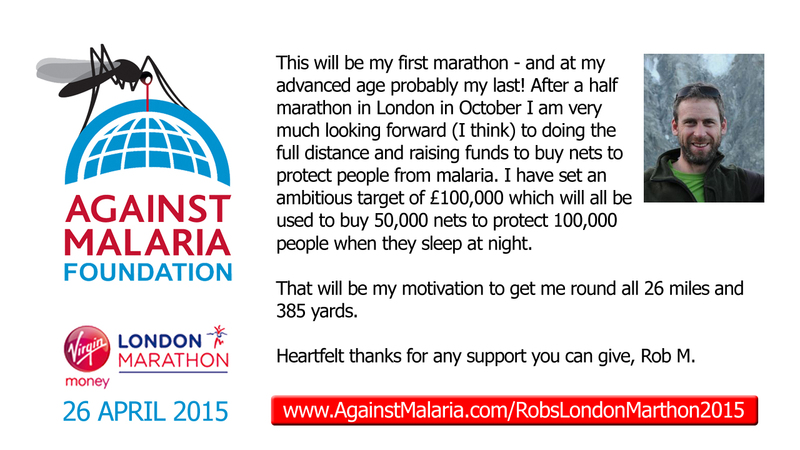 After a half marathon in October I am very much looking forward (I think) to doing the full distance and raising funds to buy nets to protect people from malaria. My motivation to get round all 26 miles and 385 yards is to add thousands to the millions already protected from malaria thanks to our fantastic group of donors across the world. I have set an ambitious target of £100,000 which would all be used to buy 50,000 nets to protect 100,000 people when they sleep at night. Heartfelt thanks for any support you can give."